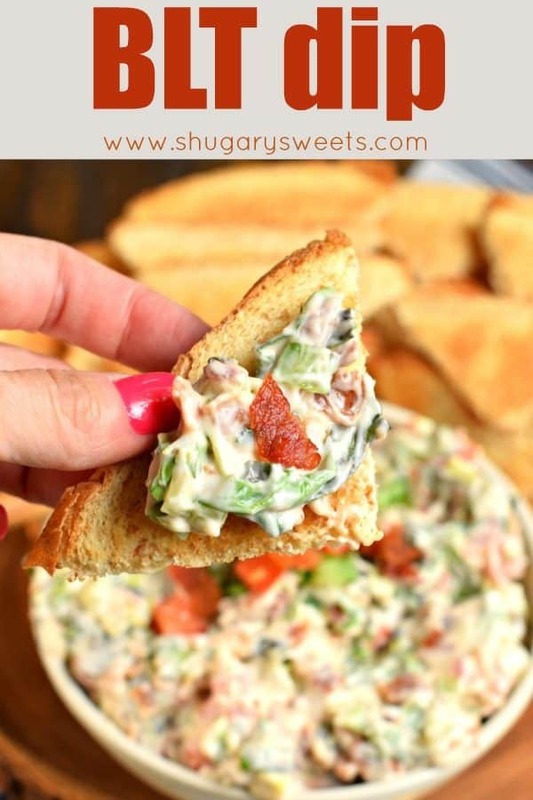 If you love Bacon, Lettuce, and Tomato sandwiches, you’ll devour this easy BLT Dip recipe in no time! Creamy and crunchy and perfect for game day! It seems like every time I have the intention on making today’s BLT dip, the bacon disappears. I have been wanting to share this recipe here for AGES, but as quickly as it’s made, it gets eaten. I took matters into my own hands now that the kids are back to school and made it during the day. Ha. They didn’t even know it existed, since I hid the leftovers in the refrigerator and continued to enjoy them in secret. But seriously, that’s how amazing this dip recipe is, it gets eaten so quickly, BY EVERYONE. 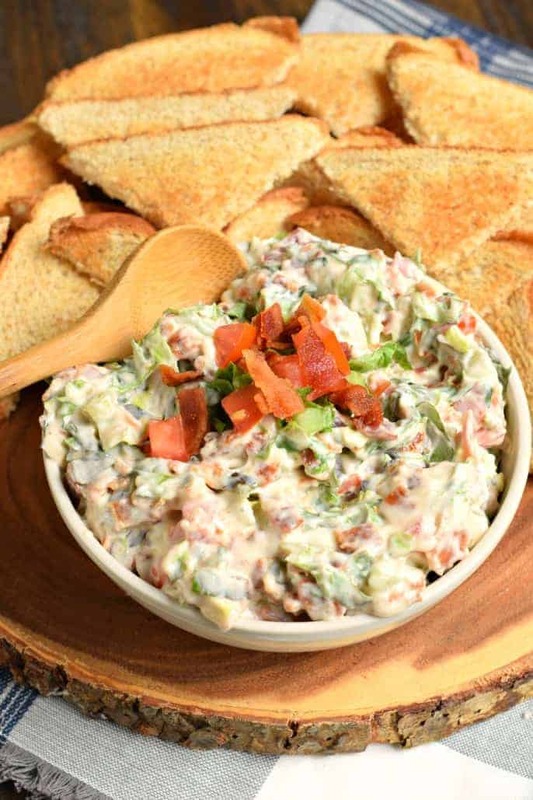 If you love a crisp, flavorful BLT sandwich, I think you’re going to go nuts for this BLT dip. Are you sitting here wondering what on earth is a BLT? Bacon Lettuce and Tomato. It’s a sandwich served with mayo on toast. So why not make it a dip? First, start by cooking your bacon. 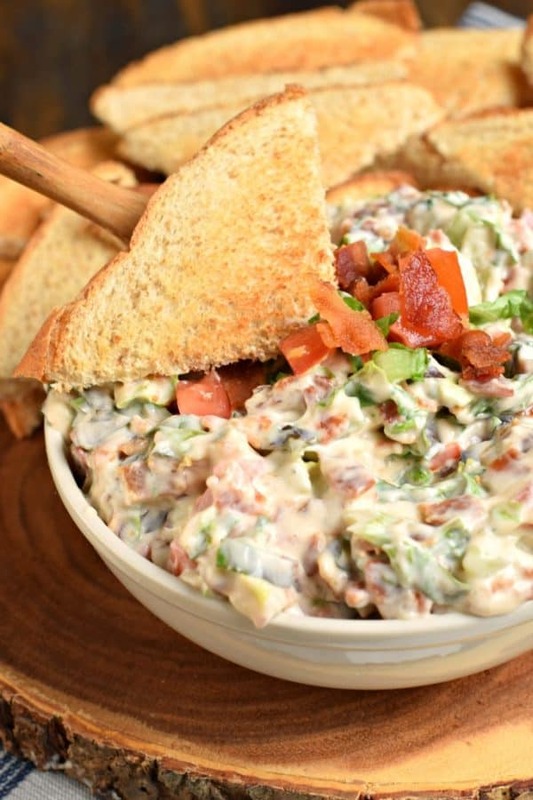 One bowl of this dip needs 1 pound of bacon. I like to make my bacon SUPER crunchy for this recipe. It will soften slightly anyway, so no need to have it turn out chewy, ya know? PRO TIP: Chop up your tomatoes and your lettuce into small pieces. 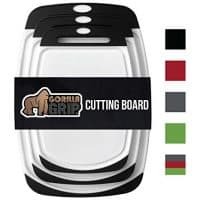 You want to be able to scoop it up as a dip, and big bites of either would not taste as good. For the creaminess, either use Miracle Whip or mayonnaise. I’ve done both and prefer the Miracle Whip for a little extra zing! I like to serve mine with toast. I cook up the toast to my desired browning, then cut each piece of toast from corner to corner, making triangles. 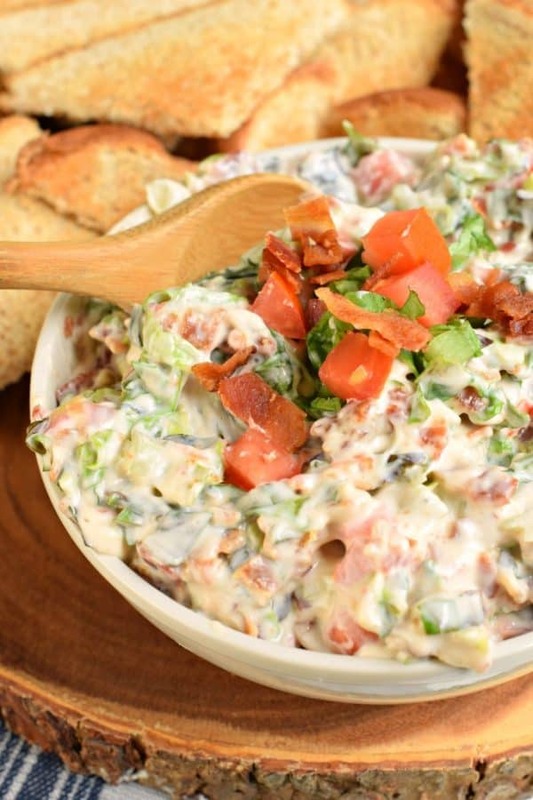 This dip is also great with bagel chips, tortilla chips, and pita chips! My family has also served it up with crackers. Do what works for you! 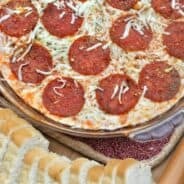 If we’re having a party with friends, I usually double this dip, because it will go fast! Tropical Pineapple Salsa is a spicy, sweet, colorful snack idea! So versatile, you can enjoy with tortilla chips or spoon it over your favorite grilled chicken or fish! 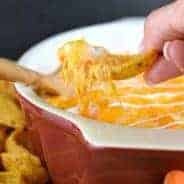 Cheesy Bacon Cheeseburger Dip from Wishes and Dishes is the perfect game day dip recipe that has all of your favorite flavors of a bacon double cheeseburger turned into an addicting appetizer. 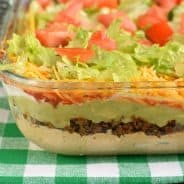 If you’re always tempted to dive into the dips on game day, this Healthy 7-layer Dip from Cookin Canuck is for you! Fewer calories, but plenty of flavor. 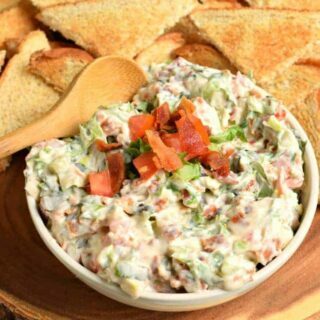 BLT Dip recipe. A classic appetizer based off a classic sandwich. Delicious and perfect for game day! Cook bacon extra crispy (according to package directions). Chop and add to a large bowl. Add tomato and lettuce to bowl with bacon and mix in the miracle whip (or mayo). Refrigerate until ready to serve. To serve, toast bread to desired browning. 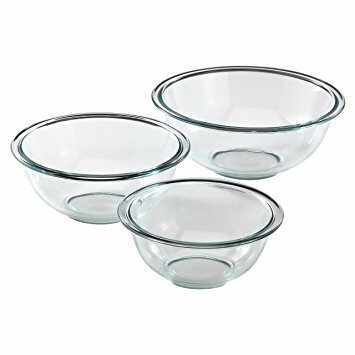 Cut bread corner to corner and serve with cold dip. ENJOY! Longtime favorite dip! We add sour cream with the mayo, and fresh basil in the summer. Bacon cooked in the microwave comes out perfect for this. You are so right-always disappears! I enjoy your blog, especially your fudge/ candy recipes. Thank you. Keeper it is ! Thank you ! Long-term most loved dip! We include sharp cream with the mayo, and crisp basil in the mid year. Bacon cooked in the microwave turns out ideal for this. You are so right-dependably vanishes! I love BLTs – they are my ultimate comfort food. I might mix in a bit of yogurt with the mayo – do you think that would work. This is such a fun recipe! OMG, you turned a BLT into a DIP?!? I’m in — this looks delicious!